We always strive to deliver solutions on our customers' terms. Therefore, we are extremely flexible and meet our customers' needs and wishes, if possible. 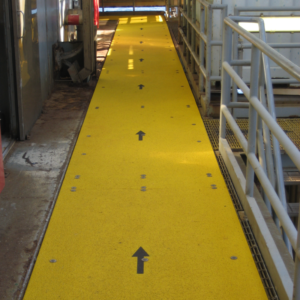 Walk way covers from Real Safety are a fast, easy and effective solution to avoid slip and fall accidents. Our sheet profiles are made of high quality glassfibre, into which small, sharp silicon stones have been embedded. This provides a very strong and non-slip surface, which also ensures a long life. 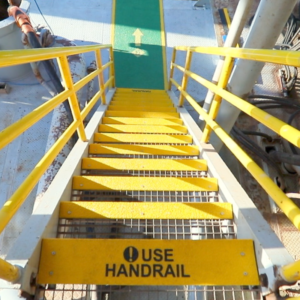 Our anti-slip sheets can be installed on all surfaces that benefit from being slip-proof. We often see that the sheets are mounted on bridges and walkways, door plates and exterior wooden surfaces. We always strive to deliver solutions to our customers' terms. Therefore, we are extremely flexible and meet our customers' needs and wishes, if possible. When we produce anti-slip sheets, we have the option of coloring these in an optional RAL color. Similarly, we can embed pictograms and/or text in the sheets, if desired. There can be significant benefits associated with embedding text and/or pictograms in the sheets, as this allows you to communicate safety messages via the sheets. 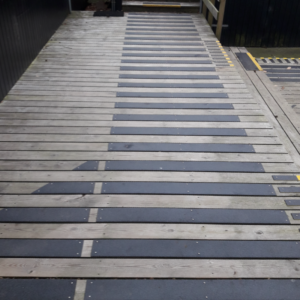 More and more companies are choosing to embed important warnings or instructions into our flooring solutions, because they are more visible than the ones hanging on the wall. +45 26 11 44 66 or realsap@realsap.com. Our non-slip sheets are manufactured in a way that makes them easy to mount. This allows the sheets to be mounted seamlessly on a variety of surfaces, such as concrete, steel, metal or wood. When you buy a solution from us, you can choose to mount it on your own. An easy-to-understand guide is provided that explains how to install the product. Should the guide be inadequate, please contact us on the following number for further assistance. If you should happen to have any kinds of questions about our anti-slip covers, we would be glad to answer them all. We can be reached on phone as well as via e-mail.